There is nothing better than a slice of perfectly cooked pizza! Unfortunately it can be challenging to make one in your home kitchen. But with the right equipment and an easy to prepare recipe for the dough you will never eat pizza from a box again! There are a number of artisan-quality pizza stones, tools and accessories that can make the job of producing the perfect pizza a lot easier. With the right easy to make recipe along with the right equipment you will be making hot, fresh and personalized pizza right in your own kitchen. From preparing the dough to baking the pizza and serving it to friends and family, you will be able to make crisp crusts with melted cheese and fresh toppings. Did you know that New York City's Lombardi's restaurant, founded in 1905, was the first licensed pizzeria in the United States? I love to make pizza using pita rounds. This way everyone gets an individualized pizza. I can add the toppings they like and no one complains that they didn't get the pizza they wanted! You will need to make sure you preheat the oven to 375 degrees. Take the pita rounds and spread pizza sauce over them. Top with the mozzarella cheese and other toppings. Put them on a cookie sheet (or use a pizza stone) and bake in the oven for 7 to 10 minutes, or until the cheese melts and the pitas are crispy. These also make a great snack or serve them at your next party! When Italian immigrants began arriving in the late 1900's they brought their recipes from Italy with them. It seems that pizzas were first sold by peddlers who would sell pizza from the street. The peddlers could be found in cities such as New York, Chicago and Philadelphia. It didn't take too much time for small cafes to start selling pizzas and other Italian food to the new Italian-American community. You will find the first printed reference to pizza in a Boston Journal article in 1904. Two brother who came from Naples Italy were the first to offer their pizza in 1903. The price of a pizza pie was five cents! But since that was a lot of money back then, people would negotiate the amount they could spend and then were given a slice equivalent to the price they could pay. In 1910, pizza game to Trenton New Jersey with the opening of Joe's Tomato Pies. And the D'Amore family started selling pizzas in Los Angeles in 1939. It wasn't until after the Second World War that pizza became popular with more than just the Italian community. Soldiers who were in Italy during the war got a taste for pizza and other Italian dishes. Soon there were all sorts of chain restaurants opening around the US including Shakeys Pizza (1954), Pizza Hut (1958) and Josey's Pizza (1943). Today there are many popular pizza restaurants and most have home delivery. 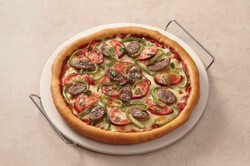 The most popular are Domino's, Papa John's Pizza, Giordano's Pizza, and Godfather's Pizza. I'm only a thin crust pizza fan! A thick crust all the way! Love those deep dish pizzas! I'm into stuffed crust pizzas! Do You Make Pizza at Home?